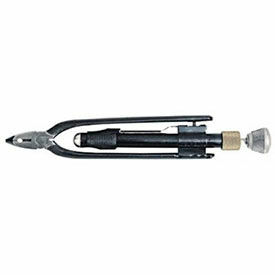 Safety Wire Twister Pliers Provide Wire Maintenance For Automotive, Aviation, Maintenance, and Other Applications. These safety wire twister pliers are designed to cut, strip, and grip wire for electricians, mechanics, and other technical and mechanical work environments. The heat-treated cutting edges cut stainless steel safety wire for added strength and durability. The flat top diamond jaw serrations hold wires securely while resisting nicking or damage. The automatic spring return improves the plier operation speed while reducing user fatigue. The diagonal nose is useful for conveniently accessing tight work areas. 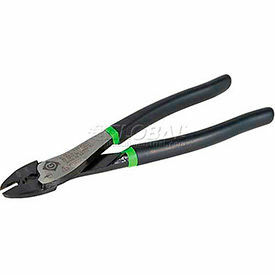 Crimping & Cutting Pliers are used for Wire Stripping and Terminal Crimping. 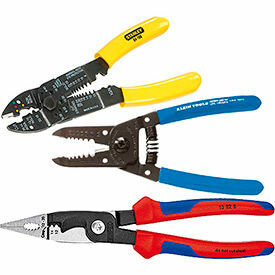 Crimping and Cutting Tools work with both insulated and non-insulated terminals and connectors. Available styles are Smooth Pivot Action, Tapered Nose, and Self-Adjusting. Tapered nose is ideal for working in tight spaces. It also has a specially hardened wire cutter in the nose of the tool. Smooth pivot action tool allows it to be used with one hand. Self Adjusting tool fits all twin- ferrules within the application range and can self-adjust to the size of end sleeves. OALs are 7-1/4", 9-1/2", and 9-3/4"
Wire Strippers & Cutters are available in a variety of sizes, styles and specified functions for use during wiring applications. Choose from several trusted brand names.